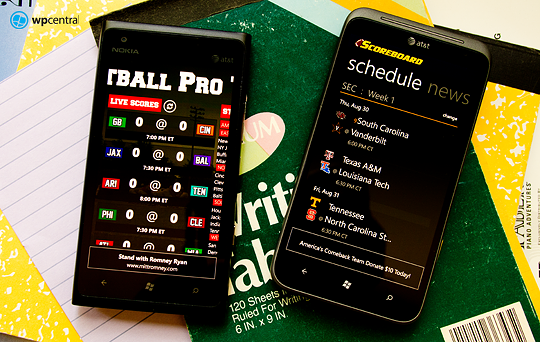 Football season is upon us and there are plenty of Windows Phone apps to help bring all the gridiron action to our phones. Sure, you have sports apps such as ESPN and Score Mobile that will bring your all the scores, news and videos from the sports world but what about those that just focus on football? We've collected a handful of apps that place football center stage. We've got a few professional football apps and a few college oriented apps for those who prefer the NCAA over the NFL. We even toss in a football app for those who see football in a different light. As always, if you have a favorite football app that didn't make it to the roundup, sound off in the comments section and share. NFL Scores (free): Let's start things out with a simple, straight forward app for keeping track of the NFL scores and standings. 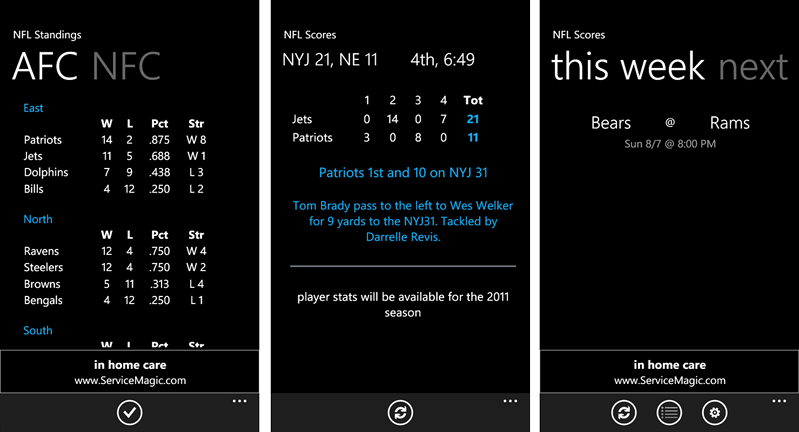 NFL Scores doesn't have many bells and whistles but that doesn't mean the app is lacking. NFL Scores spreads things out in panorama fashion with pages for the NFL schedule for this week, next week and last week. Tap on a game to see the line score, player stats and odds. Individual games can be pinned to your Start Screen and scores will be updated while the game is in progress. Need to check on the League standings? Just tap the Standings Button at the bottom of the main screen. NFL Scores isn't a bad choice but if you need news, videos, and features beyond just the scores you may want to look elsewhere. 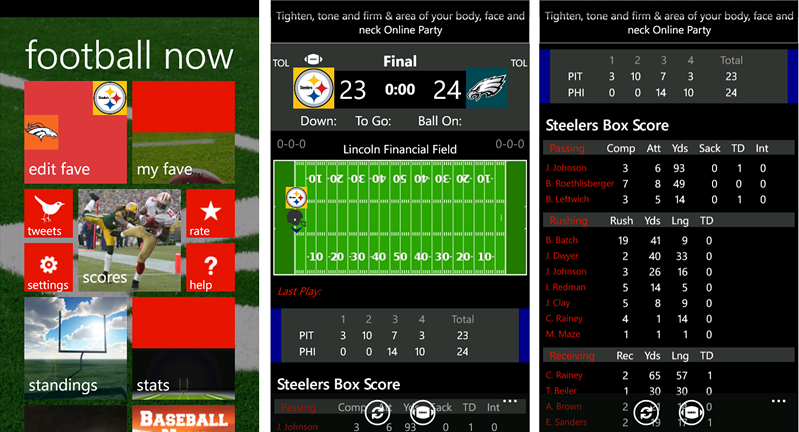 NFL Scores is a free, ad supported app for your Windows Phone that you can grab here at the Windows Phone Marketplace. Football Now (free): Football Now was recently redesigned to incorporate Windows Phone 8 styled tiles into the main menu and animated wallpapers. As far as content goes, Football Now not only delivers scores and stats but also will let you follow NFL tweets, read up on all the latest NFL News and track your favorite team. 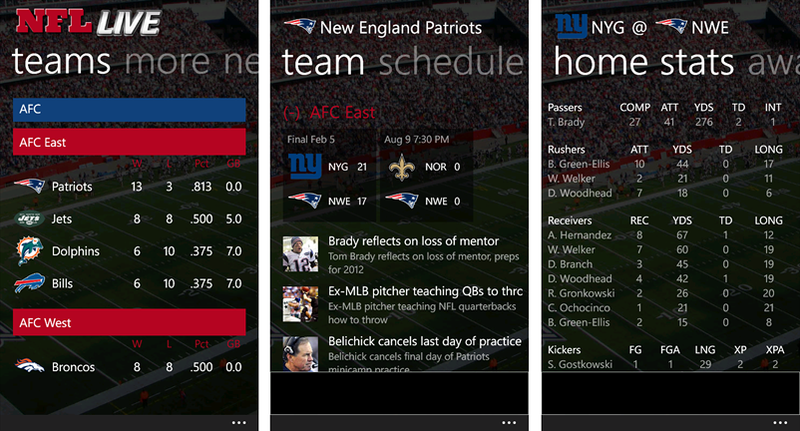 The main menu is a series of tiles, much like your Windows Phone Start Screen, with options to choose a favorite team and view stats, scores, standings, news, twitter feeds and the app's help/settings screens. You also have a My Fave tile that highlights your favorite team that will pull up the latest news on that particular team. In tapping the Scores tile, you'll see a listing of the games sorted by week. 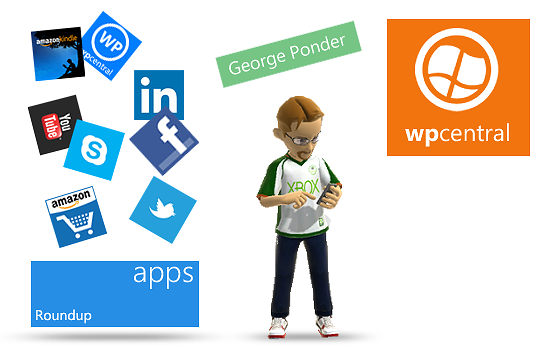 Each game can be pinned to your Start Screen and updated with push notifications every ten minutes. In tapping an individual game you can pull up the line scores and an animated graphic detailing play by play action. The only thing really missing is individual player stats. You can view stats for game leaders and season leaders but there isn't a player roster breakdown. Football Now is a free, ad supported app for your Windows Phone and you can grab it here at the Windows Phone Marketplace. NFL Live (free): NFL Live delivers scores, stats, schedules, Twitter feeds for the NFL, FOX Sports and ESPN, live game details and a good bit more. NFL Live is laid out nicely with main pages covering news, scores, teams, and a More Page that has options for stats, ESPN Videos, Tweets, a link to the NFL Fantasy League and the app's settings. You also have the ability to tag a team as a favorite (in the settings) and an additional page will be created for that particular team. A secondary team tile (your second favorite) can also be created from the team pages.Tap on an individual team and NFL Live will offer pages for that teams news items, schedule, roster, and twitter page. You can go a bit further by tapping on a team member on the roster page to view a player profile. Individual games offer live scoreboards, live player stats, and a neat "shake to refresh" feature to update the details. NFL Live isn't too shabby of an app for keeping track of the NFL Season. 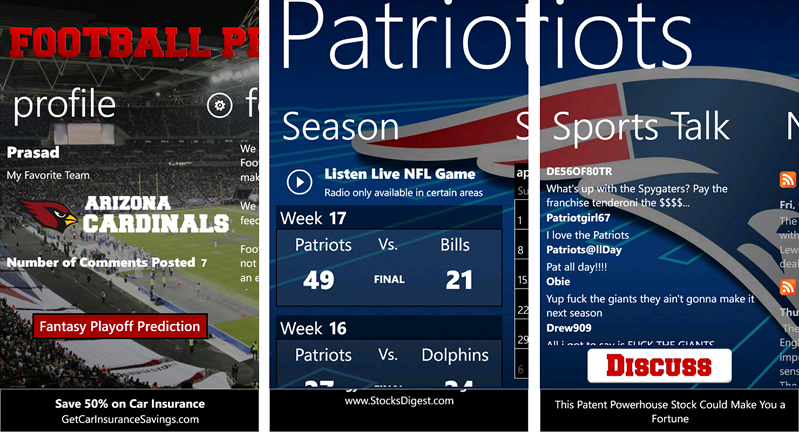 NFL Live is a free, ad supported app that you can find here at the Windows Phone Marketplace. Football Pro '13 (free): Football Pro '13 (formerly known as Football Pro '12, which was formerly known as NFL Pro '12) provides you with scores, stats, news, and standings for the NFL Season. Additionally, the Windows Phone app delivers a Fantasy Playoff Prediction where you can predict who is going to win the Super Bowl and Live Radio to listen in on game broadcasts. Football Pro '13 is laid out in Modern UI fashion with pages for your profile, live scores, standings, team information, and an information page (about screen, rate/review). Gamecasts are provided by ESPN and in tapping on a division, you'll see all the teams listed and sorted by division. Just tap on a team to pull up the roster, schedule, sports talk and latest news on that particular team. Teams can be pinned to the Start Screen and there's a Talk Radio button to pull up the live sports talk. 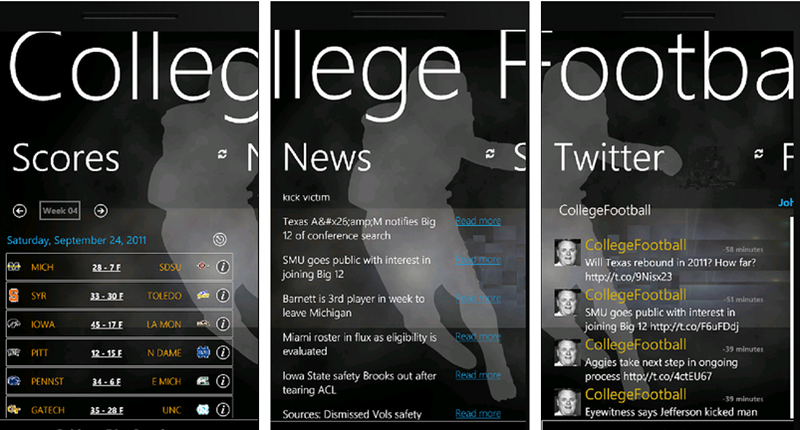 Football Pro '13 is a free app for your Windows Phone and you can find it here at the Windows Phone Marketplace. College Football Scoreboard (free version/$.99): If you aren't into the NFL and College Football is more your cup of tea, College Football Scoreboard isn't a bad choice to pull in all the Saturday scores to your Windows Phone. In addition to scores, College Football Scoreboard offers up news and schedules. Scores for games in progress can be updated in thirty second, one minute or five minute intervals. There is Live Tile support but it only shows when games are in progress. By default, College Football Scoreboard lists the schedule and scores for the Top 25 teams. You can go in and change the display to a particular conference and even flag a conference as a favorite (adds it to the Favorites page in the change screens for easy access). However, once you exit the app the schedules/scores reverts back to the Top 25. A little frustrating if your favorite team isn't in the Top 25. College Football Scoreboard has potential and is a decent app for checking up on the College scores. 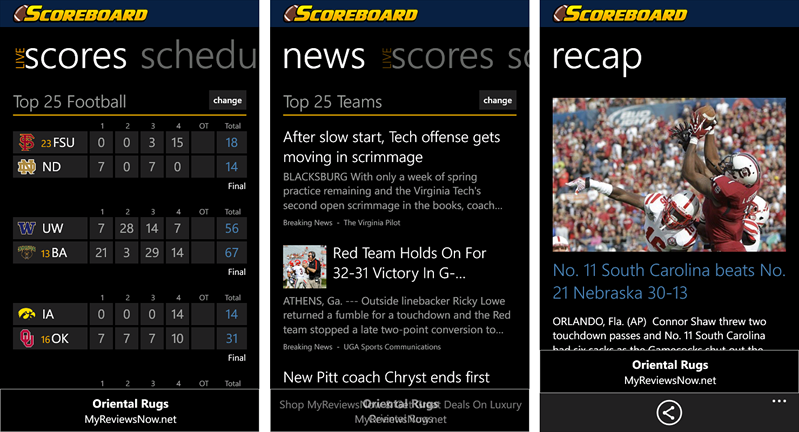 There are two versions of College Football Scoreboard available on the Windows Phone Marketplace. There is a free, ad supported version of College Football Scoreboard and an ad free, paid version that is currently running $.99. College Football ($1.99): College Football offers game scores, news from ESPN, standings in each conference, BCS rankings and updates from official Facebook and Twitter feeds. College Football will also share the statistical leaders from BCS schools. The most noticeable problem with College Football is that it lumps too much together. You can filter the scores by conferences but the standings page lists each conference on the same page. This requires you to scroll around a lot to find what your looking for. The news page has the same challenge. Scores can be updated by tapping a refresh button and there doesn't appear to be any settings to have this done automatically (if there is, the settings button is well hidden). I liked the appearance of College Football with the minimalist graphics and Modern UI navigation but it just needs a few more filters to let you concentrate on your interests without spending time sifting through other conferences. College Football is a nice app but one that has a bit of room for improvement. The biggest downside to the app is that there isn't a trial version available. The full version of College Football is currently running $1.99 and you can grab it here at the Windows Phone Marketplace. ESPNsoccernet (free): For many, the game of football is a game where you kick the ball around trying to score goals instead of touchdowns. For those who cherish this brand of football (a.k.a soccer) you have ESPNsoccernet. ESPNsoccernet delivers to your Windows Phone comprehensive football/soccer coverage that includes news, scores, match stats, fixtures, league tables and club/player profiles. ESPNsoccernet can be customized to follow scores and news from your favorite teams, leagues or tournaments. Push notifications are in the works to help you keep up with games in progress. Hopefully this feature will be included in the next update. All joking asides, there are plenty of quality soccer... err... football apps out there such as Euro 2012, ScoreMobile FC and Soccer Scores Live. ESPNsoccernet would have to be included on the short list of football apps. As with other ESPN apps, ESPNsoccernet is nicely laid out, feature rich and worth a look if you prefer to pass the football around by kicking it. 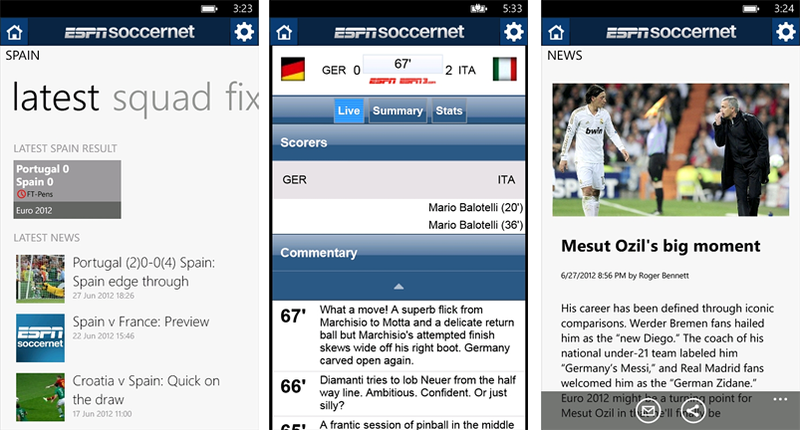 ESPNsoccernet is a free app that you can grab here at the Windows Phone Marketplace. Asides from the broad based Windows Phone apps that covers NFL and Collegiate football, there are countless apps available on the Marketplace for specific teams, conferences and leagues. For example, the University of Alabama has the Alabama Football News (free), the Southeastern Conference has the Official SEC app (free) and the Green Bay Packers has the several apps including the Green Bay Feed (free). The developers of these examples offer apps from other teams, leagues and conferences giving you options beyond what is in today's Roundup. Football is followed religiously by many and hopefully one or more of these apps will help you keep track of your favorite teams this Fall. If we have overlooked your favorite football app, it shouldn't reflect poorly on things. There's just so much time in a day and space available. If you have a favorite football app, feel free to recommend it in the comments below.